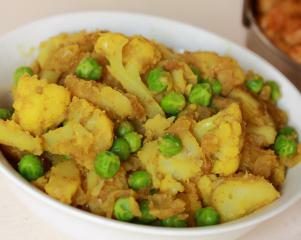 Aloo Matar Gobi (Potato, Peas and Cauliflower). This tasty and colourful side dish should be a part of any Indian feast. Makes enough for four as a side. Cube the potatoes. Boil them in a small saucepan until soft. Drain and set aside. Finely chop the onion, garlic and ginger and gently fry them in a little oil. When the onions are soft add the spices, cauliflower and potatoes. Cook for a few minutes, then add half a cup of water and the peas, cover with a lid and leave to simmer for 5 minutes. Remove the lid and let any excess liquid cook off. Season with salt and serve.